OTI Racing’s director Terry Henderson is expecting Gallic Chieftain to return to his best when he lines up in the Group 2 $200,000 Bradford Access Insulation P.J. O’Shea Stakes (2200m) at the Sunshine Coast on Saturday. Gallic Chieftain, above, is expected to return to his best form in the P.J. O’Shea Stakes at the Sunshine Coast. Photo by Steve Hart. Gallic Chieftain races in the QTI Racing’s navy blue, gold and white colours and Henderson is willing to overlook the French imports last start flop when tenth to Rising Red in the Group 3 $125,000 Channel Seven Premier’s Cup (2200m) at Doomben last Saturday. Henderson said that Gallic Chieftain wasn’t at home on the chopped up Doomben surface last week and he is looking forward to seeing the five year old backing up this weekend. “Honestly the track was ordinary and didn’t suit him at all,” Henderson told racing.com. The Darren Weir trained Gallic Chieftain was chasing a hat trick of wins when he arrived in Brisbane for the Queensland Winter Racing Carnival after a win over 2530m at Flemington followed by a win in the Listed $200,000 Warrnambool Cup (2350m) at Warrnambool on May 3. A return to form by Gallic Chieftain in the P.J. 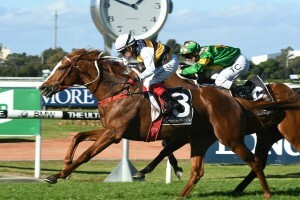 O’Shea Stakes will see the import push on to the Group 2 $300,000 Pages Hire Brisbane Cup (2200m) at Doomben on June 9. Weir has also nominated Tradesman for the P.J. O’Shea Stakes and the six year old gelding was also a winner at the Warrnambool Carnival in the Open Handicap over 1700m before finishing ninth to Comin’ Through in the Group 1 $650,000 Hardy Brothers Doomben Cup (2000m) at Doomben on May 19.